I have another problem (posted on another topic aswell), but i think it could be linked to this problem. My problem is that i have a similar problem, but not between front and rear but between left and right. On the left side i have a temp differance. The maximum differance is at the highest when you put both sides on "LO" and i think it's +/- 5 degrees celcius differance). It's not hot air comming out, but it feels like there is no airco comming out. The icey feeling like airco is missing on the left (drivers) side. Right side is fine. And the problem is on left side all vents, not only centre console. I've checked the sun sensor and it seems to act weird, but after disconnecting it's doenst fix my problem, so that couldn't be it. Someone adviced to change the 2 inside temp sensors, but i'm not sure how and if this is possible because i think it are 2 different types of sensors. Thanks konigstiger for your prompt reply. How do i check the refrigeran? Could that be the problem althou i have airco comming out on the right side? Thanks konigstiger for your prompt reply. How do i check the refrigeran? Could that be the problem althou i have airco comming out on the right side? Perhaps you should have dealer or independent check refrigerant and retrieve any fault code(s) that may be stored with SDS for proper diagnose. Thanks for a terrific set of DIY instructions. I do have one question though. When you remove the wiper arms are the posts to which they are attached keyed in some way, so as to keep you from putting them back on the wrong way? I've never pulled these off my 04 and I want to make sure I put them back on right when I replace this valve. It was periodically driving me nuts blasting air from hell during the heat of the summer.... then it just stopped doing that to my personal delight, until this morning after a cold front had come in... and I had no heat on the way to work this morning....LOL. So it's time to finally break down and do this. Thanks again for the great write up and pictures. The wiper arms are not keyed, but you may want to note their position so you get them back properly. The post is grooved so they do "engage" into an alignment of sorts. Hope this valve works for you. After I replaced mine I still have the issue and it appears my driver SAM is the culprit here sending an improper signal to the valve. I have to replace the SAM. Thanks Key08. I hope to God it's not the SAM.... I'm not sure what that acronym stands for....LOL. But anything that involves a computer on these cars ends up uber expensive. The valve was acting up off and on all summer.... doing all the things that people had remarked about. And now there's no heat. I'll see if I can find some kind of white marker to put a couple tick marks on the posts to mark them before I pull them all the way off. I don't suspect I'll have time to do this until this weekend. And as I live in Texas it's rarely all that cold. However... if the valve doesn't fix the problem and I run into your same error.... it's time to trade in the car. I still have to replace the gas tank which is $1700. That one still riles me. I've never had a benz with a leaking gas tank.... and I've owned 5 or 6 others. Thanks again for the heads up and I'll post results after I change it out. I think 99% of the rear heating/cooling problem is this valve and I just happen to be in the 1% where it is the driver SAM that controls the valve not functioning properly. Now that cooler weather is here in Chicago I am not experiencing the problem since it really exacerbates when it is very hot out. Replacing the SAM is a grand from my dealer and I haven't priced it with an independant yet, but I'm in no hurry. 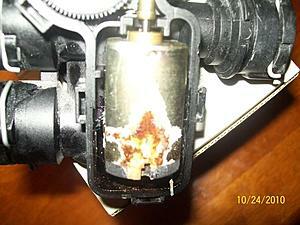 The DIY on this valve replacement is very easy and you should have no issue. Sorry about your gas tank. That is nuts. Hey KEY08..... After a little knuckle bashing and scraping.... I got the new valve in and have heat again. Thanks for everyone who posted notes in here.. it was a big help. I can't remember if anyone else commented on this, but when you put the new valve in wait to reattach the hose on the top... it makes it a hell of a lot easier to get the new valve wiggled into place. And as a few others have pointed out... I don't know how in the hell anyone would have managed to change this thing out w/o removing the windshield wiper motor assembly... OMG. Yeah, it takes no time to remove the wipers, otherwise you are working almost blind and feeling your way. The only thing I ran into was an inordinate amount of coolant that seemed to keep running out as much as I tried to minimize it. It is an easy DIY if you just take your time and feels good when complete. I'd would just like to offer my thanks to the gentleman who was gracious enough to take the time and effort to post those pics and directions for the replacement of the valve. I would also like to add that removing the wiper assemlby beyond just the wiper arms is not as diffucult as one would think. 2 nuts and one bolt and an modular electrical connection and its removal creates considerably more room to work. The Job took about one and a half hours from start to finish. Special thanks to my wife who held the light and was my advisor during the proceedure. Replaced Change over valve. Car si still blowing cold air. Can someone please HELP. Is there a fuse that might be out or what. Please help. Update. It seems that when I changed the valve I immediatly started the car to check fo leaks. I did not get heat and concluded that the new valve did not work. Well I took it out on the road and low ane behold the heat worked. THansk for the excellent post and dollars savings. Whole change took about 1 1/2 hours. Saved $250. toyed with the idea of taking out the fuse box to get to it, not a good idea. of the master cylinder, where the change over was simple, then squeezed it back to where it came from. opened the old part, and yes it had let in fluid and corroded, after 6 1/2 years. then only another 35 mins to put everything back. Great article by RYDA and pics which started me off to replace my valve.However as I lifted the foam padding I too found it not to be there as did peter-the-hat, I think mine to be under the master cylinder so I will try again over the weekend weather permitting and have another go.My car is an Eclass 270cdi ,couldnt find a how to for my model but thanks for the above in quote. Picked up the valve from my local dealer, $42.55 - not a bad price! Plan to install it this weekend - thanks in advance to the original poster for the DIY step-by-step. Removal and installation went very well, took about an hour. Many thanks to all who posted, removing the wiper motor assy was especially pertinent. I've never so much as changed my own oil, but successfully performed this DIY with this walk-through by my side. It took me approximately 3 hours with some minor SNAFU's. ~ I had to replace all 4 rivets as I expected. I already had them on hand for the job. ~ My E320 did not have the mystery module, so I didn't need the Torx 25 bit. ~ I broke the air intake on the molding right off. Fixed it with super-glue and electrical tape. Good as new!!! ~ After I had replaced the plastic molding, I discovered I had forgotten to plug the wiper motor electrical wires back in. Off came the molding AGAIN!!! This time I was super careful and saved all 4 rivets. ~ All-in-all it took 3 hours, 1 cigar, 1 beer and $60 to complete this job. If I could do it anyone can. Great post. I easily managed this repair. Hot and cold air when controlled from front. But the rear control panel has no illumination nor control. What could this problem be? Thanks Ryda and everyone else who added to the post just got done with this job and without this post and all your help I would have ended at the stealership btw taking the wiper arms really gave me the extra clearance thanks!!!! Hello all, this DIY thread saved me quite some bucks! Just did it in about an hour incl. removing the Wiper assembly. The valve was about € 35:-. MB garage suggested a repaircost of around €1200-1300:-, went on about some valves behind the instrument panel that needed to be replaced as well...they would have to remove the whole glaresheild to do that??! My heating system works fine now having only replaced this one valve. Does anyone by chance think this part would cause heat to be just warm and not hot? Last edited by malahhaor; 12-08-2010 at 12:14 AM. 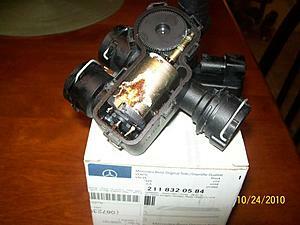 hi, I have 2003 E320 model, My AC works perfect but no heat, by doing the above part replacement, will fix my problem? any info will be helpful ! I've slso got heat problems on my E350, so I bought this part and tried installing it. I got everthing attached, however I could not get the engine bay hose to snap in to the new part (I even tested putting it back into the old part which I was able to do). Has anyone else done this fix to a E350? Where is everyone getting this part for so cheap?